Tumblr can be a challenge for businesses to crack. The site provides a blogging platform, but it’s also a social community — and a very insular social community at that. If you approach Tumblr with a conventional social strategy and your usual marketing patter, you’re not likely to get very far. Still, this doesn’t necessarily mean that Tumblr shouldn’t be part of your social plan. If you do your homework before getting started on this social platform, you will find it’s a great way to engage with your customers. Let’s take a look at whether Tumblr is right for your business and how to make best use of it. Is Your Audience on Tumblr? Not all businesses will find a receptive audience on Tumblr, as the site’s userbase skews young. But if you’re targeting a youth demographic, the network could be just the thing to reach an engaged audience of tech-savvy individuals between the age of 18 and 29. Still, demographics don’t tell the whole story. If this sounds promising to you, head to Tumblr and see what you can find related to your business. Are your competitors using the site? Are their posts sharing information, discussing issues, or asking questions that are relevant to your business? If the discussion is already there, it could be an opportunity to insert your brand into those conversations, making Tumblr a good fit for your business needs. If you’ve spent some time researching on Tumblr, you’ll find that individuals on the site have their own way of talking. The network’s tone is quite casual, and you may see entire conversations happening in tags on a post or entirely in exchanges of GIFs. Though you don’t want to ignore your brand’s messaging standards, you will want to speak to your Tumblr followers on their own terms — which means it’s a good idea to pay attention to how your potential followers communicate before you post a single message. Being overly stiff or corporate isn’t likely to gain you followers here, so you’ll want to take some care with how you communicate your message and skip the standard marketing spiel. However, to become part of Tumblr’s community, you’ll want to do more than just post original content — though that is important. You’ll also want to be sure you’re interacting with the Tumblr community by liking, reblogging, and commenting on content relevant to your brand — and, like we mentioned above, you’ll want to be sure you’re speaking in a voice that will resonate with Tumblr’s audience. You can also allow readers to send you asks and messages, which gives you a chance to directly interact with your followers — and also offers an easy way to create new original content by answering questions or addressing concerns publicly. Though this kind of interaction can be important on many social networks, it’s particularly important to making headway into Tumblr’s sometimes close-knit community. If you’re a good community member, other Tumblr users will respond in kind — but if you’re only seen to be posting marketing messages, you’re not likely to get far. All together, this helps foster the kind of community environment you’re hoping to build. What Kinds of Posts Get Results? Tumblr users respond to great content, which they’ll find either by following you or searching Tumblr’s tags. However, your content will have stiff competition as users scroll past it in line with posts from other sources on their dashboard or tag pages. To get them to stop scrolling and start reading, you want to make sure you have eye-catching imagery as well as interesting or unique content. Though you might be at a loss as to what to post with marketing content off the table, plenty of brands are already using Tumblr to great results. 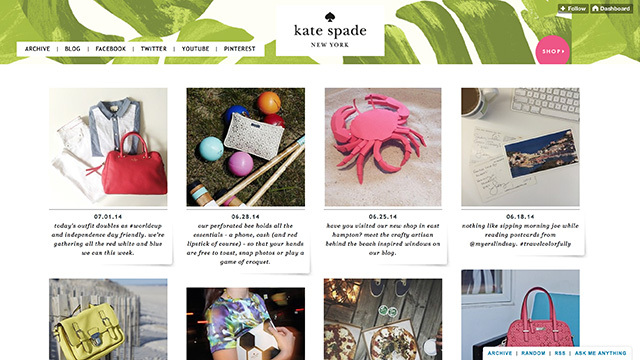 Look at fashion brands like Kate Spade and J. Crew, which both post product images and information. Television shows on Tumblr often gain social following by posting GIFs and tapping into the social discussion fans are already having about their brand. Media companies from NPR to Rolling Stone post original content with great imagery. While you may think you need to be in a creative industry to have the eye candy to catch Tumblr users’ attention, creative thinking can still garner good results. Just look at home improvement retailer Lowes, which posts Tumblr-perfect design ideas in animated GIF format. Pictures of products, pictures from around the office, or even pictures of your employees at work and play could provide you with interesting content to start posting… and start getting attention. When your posts are popular, they’ll get reblogged by other Tumblr users — similar to a share on Facebook or a retweet on Twitter — which spreads their reach even further and brings people back to your Tumblr page. It can be easy to make etiquette blunders that can trash your Tumblr reputation. Perhaps more than any other major social network, Tumblr users are sensitive to the kind of content posted to the site. This isn’t to say there are things you can’t post — because Tumblr is probably more accepting of unconventional content than other networks — but you do want to be sure your followers know what they’re getting into. To this end, it’s important to make use of Tumblr’s tagging system. Tagging posts with relevant content doesn’t only help people who might not be following you find your content, it also helps people who aren’t interested steer clear. If you’re posting imagery that might bother viewers, be sure to tag for it. If you’re posting about plot details of current television, movies, or video games — common themes on entertainment industry Tumblrs — you’ll want to be sure to tag for spoilers, too. Not doing this would be considered rude at the very least. Another major point of etiquette on Tumblr is sourcing. The community is very sensitive to stolen art or content, and while you might not mean any harm by posting what you think is a cool photo to Tumblr, complaints by uncredited artists have the potential to go viral. If you want to share something you’ve seen elsewhere on Tumblr, be sure to reblog it rather than post it into your own article — you can still add commentary when you reblog, so it’s an easy way to share community content. If you’ve found something elsewhere online that you think is worth sharing, be sure to source it before you share it. 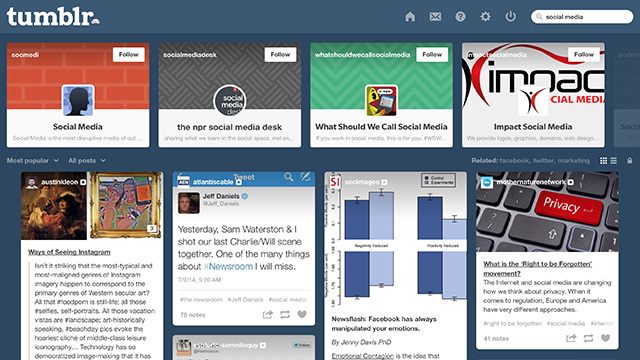 Though it might sound like Tumblr is a minefield of potential issues, that’s not the case. If you have an audience on the site, it’s very valuable to be present there. If you give these tips a try, you will find that Tumblr is a social network that pays off.